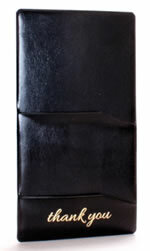 Classic & Classy & Casebound faux leather. Easily cleaned with damp cloth. Hardback- NO stitching. Strip on bottom left & top right. These presenters, unlike the "P" Series shown below, are NOT stitched. 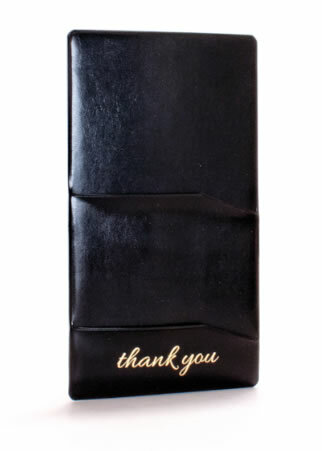 "Thank You" foil stamped in Gold on the lower right. Your minimum purchase is a dozen guest check holders. About UPS Shipping - Guaranteed FREE SHIPPING in the lower 48 states. Plus $7.50 for residential deliveries. UPS to be quoted to Canada, Alaska, Hawaii, USVI, Puerto Rico & elsewhere. with your name or logo! A $75 one-time die charge applies. Enjoy a smart & gracious look. Padded Soft Virgin Vinyl. Easily cleaned with damp cloth. Visible stitched edges. Pocket on inside bottom left & right. 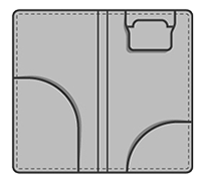 Credit card holder at top right interior. 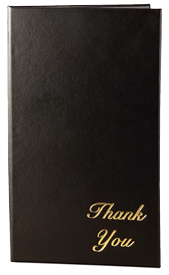 Choose "Thank You" foil stamped in Gold on the lower right, ou choisissez "Merci" feuille gravée dans l'or, sur le coin inférieur droit. If you do not want a foil stamp " Thank You," or "Merci," choose the pop-up selection that says: "Black, No Stamp"
Vous pouvez ajouter votre quantité exacte dans le panier. About UPS Shipping - Guaranteed FREE SHIPPING in the lower 48 states. Plus $7.50 for residential deliveries. UPS to be quoted to Canada, Alaska, Hawaii, USVI, Puerto Rico & elsewhere. 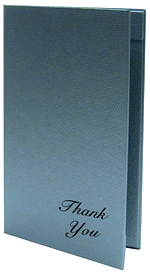 Hardback - 5" x 9" Choose Holding Strips (ST), or 3″ Diagonal Corners with a Credit Card Holder on the Inside (CRCC). Choose from patterned & textured materials. Coordinating interior. Coordinating album style corners on the inside. Do you want them gorgeously imprinted? Call 888-777-4522 in the USA & Canada right now. Please choose "HAS NO CLIP" or 'WITH A CLIP." Thank you. 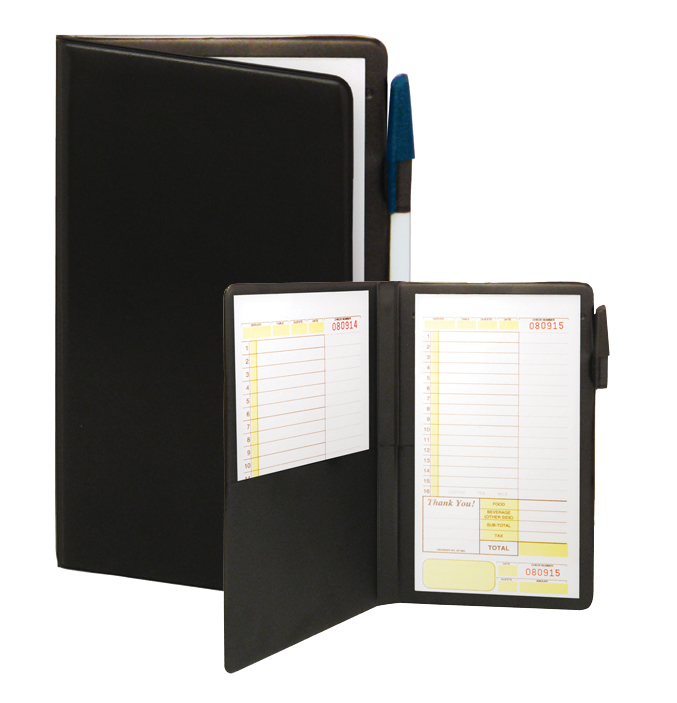 Holds up to 5" x 9" Pad or Guest Check. Wider spine than standard holder. Rounded pockets on inside bottom, left & right. 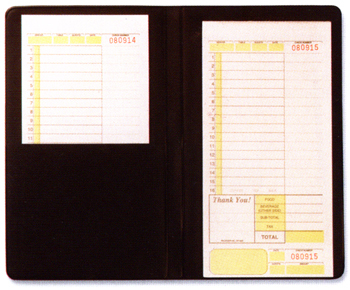 Full size bill or ticket pocket on left panel, near spine. Clip option available for top of right panel to hold tickets. Pen loop. Sold per dozen. Black only, & no imprint option is available. 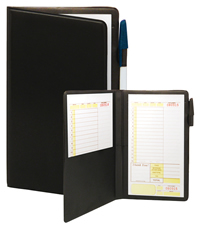 Holds up to 5" x 9" Pad or Guest Check. 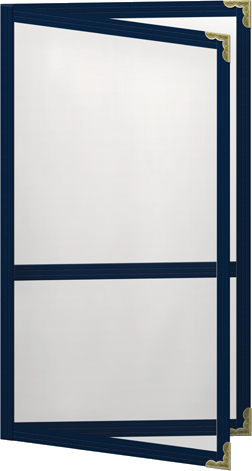 Double Panel. LED backlit when opened, & automatically turns off when closed. 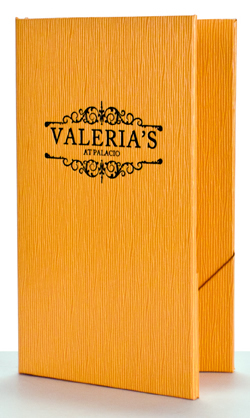 Comes with built in rechargeable battery which can last up to 4 hours during busy and continuous use. Faux leather, Black only. 3 to 4 week lead time, non-returnable. Your minimum purchase is one guest check holder. Soft illumination is eclectic, electric & symmetric.. truly! About UPS Shipping - Guaranteed FREE SHIPPING in the lower 48 states on this item when you purchase six or more. Plus $7.50 for residential deliveries. UPS to be quoted to Canada, Alaska, Hawaii, USVI, Puerto Rico & elsewhere. Sewn Guest Check Presenter. Clear Pockets. Change pocket on right panel. Turned Edge Binding. Easily cleaned with damp cloth. Gold Decorative Corners- Silver upon request. Black Vinyl Leatherette is standard. Nylon Stitched Edges are available. 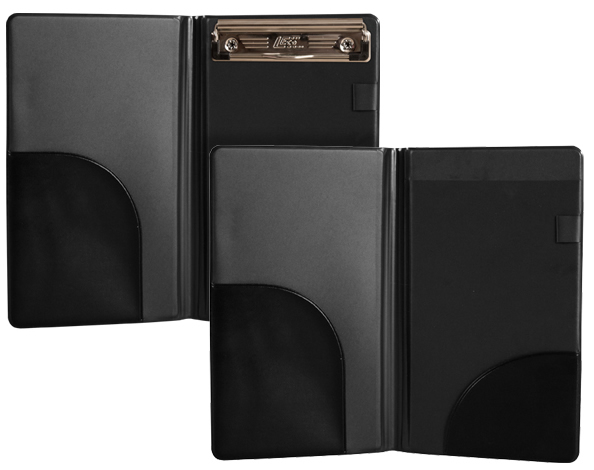 Advantage® Leatherette Vinyl Stitched Edge & Vogue® Nylon Fabric Stitched Edge match the Menucoverman menu covers of the same name & series. 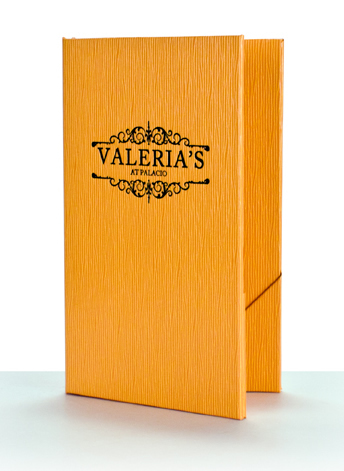 Custom orders for Retro®, Metro® & Fiesta® Guest Check Presenters matching the stitched-edge menu covers of the same name are available.. please inquire. Available in quanities of 36 or more only. 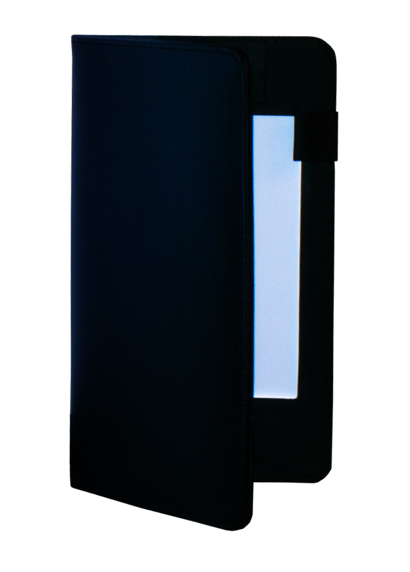 Custom sizes, matte vinyl finish, & nylon binding, are non returnable. 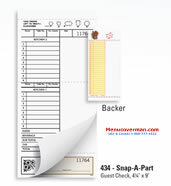 Ultra-convenient & serviceable Waitperson Pad Holder will hold your guest checks (not included). Pockets inside bottom, left & right sides. Includes a pen loop, but not the actual pen itself! This product cannot be imprinted. 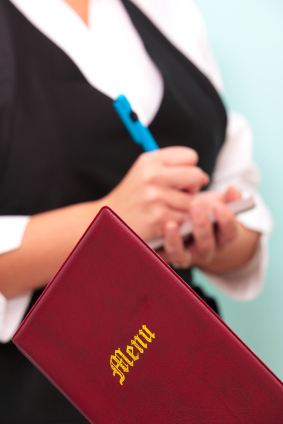 Please note: The minimum order for the waitress pad holder is 12 pieces. 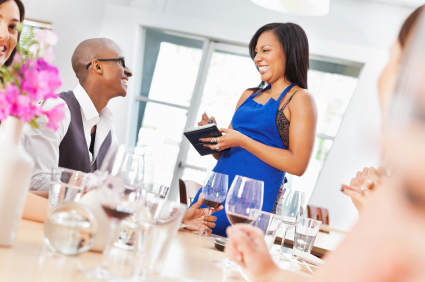 If you are ordering for yourself, personally- perhaps there are others in your restaurant who might be interested & go in with you to meet the minimum. A popular & comfortable size. It's easy to handle, & slides into the pocket of an apron easily. 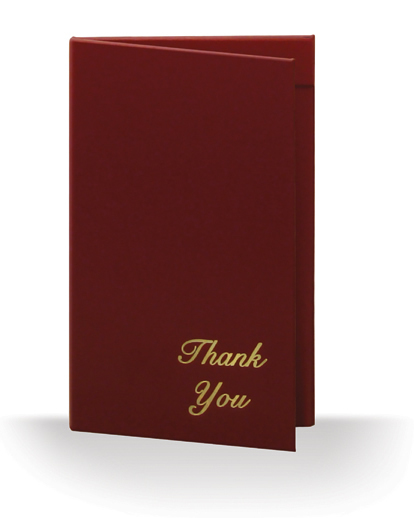 It sports a certain cachet, as well, with soft rounded corners & gold foil lower case thank you. 5" x 9" overall size. 888-777-4522 in the USA & Canada right now. We'll work with you & make it happen. Imprinted or Blank. Custom or standard numbering. Future orders are even easier.. all your info stays on file. Say how many you need, & consider it done.. FAST. Your complete satisfaction is priority one! A fine meal has come to its close, & it's time to settle the bill. 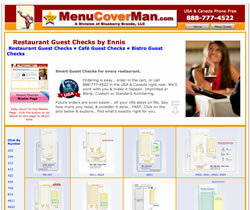 Keep the experience of graceful presentation alive right up until your guest's departure with Menucoverman's elegant, tried & true Guest Check Presenters. Trade up from those worn-out & tiredpresenters with some credit card company's name on it- let them leave you with a heartfelt thank you! 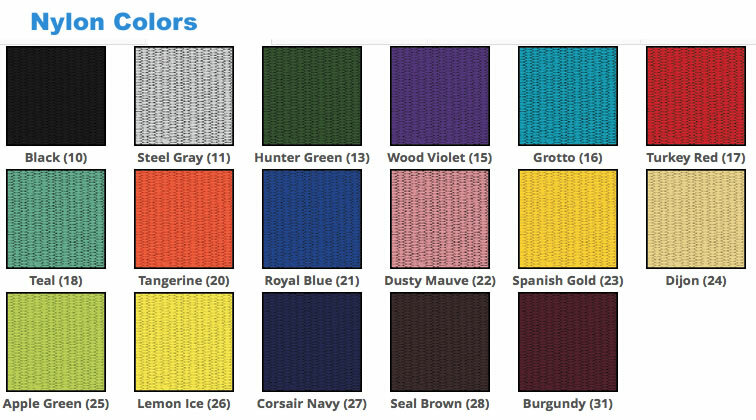 Click the Guest Check Presenter to the left to see colors and swatches. 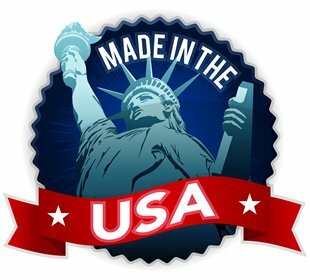 All the products on this page are proudly made in the USA.